Known for its distinctive packaging and appearance Backwoods are machine-made cigars that are naturally wrapped with a frayed end, tapered body and unfinished head. Made in the Dominican from perfectly blended all-natural tobaccos bound together with a Connecticut Broadleaf wrapper. These machine-made cigars offer each smoker a mild all-natural taste with a smooth finish. 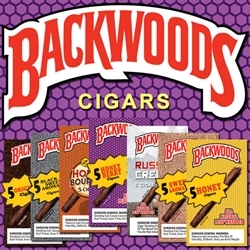 Packaged five cigars to a foil pouch, Backwoods are discount machine-made cigars presented in a sweet collection of distinctive unique styles Black 'N Sweet Aromatic, Honey and Honey Berry, Sweet Aromatic, and Wild & Mild. Each of these flavored varieties are naturally pair with all-natural tobaccos both inside and out. Cigar connoisseurs who love the feel of a hand-rolled cigar but at the discount price of a machine-made one will enjoy the classic, rustic cigarillo smoking experience of a Backwoods machine-made cigar. Smokers Discounts believes you will value and love them too! We’ve made it easy and affordable to buy cigars online. Call us for more details!